On recording with Vaughn Monroe . . .
Remembering back after joining Vaughn's band, I recall our first record date . . . Vaughn hadn't had any smash hits as yet, and I don't recall any pressure other than wanting to do a good job and be respected by our peers. One of the songs to be recorded was "There I've Said It Again." Vaughn had recorded this once before, but with no backup vocals. This time with his voice combined with our backup vocals, for some unknown reason it became a smash hit, propelling Vaughn to the top of the charts. It was the beginning of a very successful career for him. Rum & Coca Cola" was also recorded at that same recording session. If my memory is correct, "Rum & Coca Cola" was supposed to be the "A" side and "There I've Said It Again" the "B" side. Back in those days on the old 78s, you recorded on both sides. Once considered the "A" side was the song that had the best chance of becoming a hit, and then the "B" side. We recorded "Rum & Coca Cola" as the "A" side, but it was "There I've Said It Again" that became the number one hit. After that, once we had a hit, we needed to follow up with hits. This is when we recorded "Let It Snow," The Moon Album," "I See You In My Dreams," and others. On her subsequent career and family . . .
Perhaps if we have had a manager or an agent of our own, we possibly could have had a on-going career of our own. But, as fate would have it, we didn't and eventually marriage broke up our group. I went on as a girl vocalist for about a year, but Vaughn really did not need a vocalist. 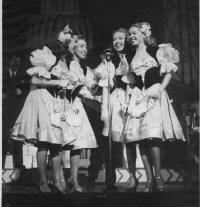 Vaughn's success was with himself and with back-up singers. So, after about a year, I left the band and did a four-week stint with Skitch Henderson's band at the Cafe Rouge in the Pennsylvania Hotel in New York City. I then joined Hal McIntyre's Band and was with his Orchestra about two years. I married one of the musicians in the band, retired from the business and had two children, my son Greg and my daughter Debra. My son is married, and now that I am retired I'm living with my daughter and my only grandson, Michael. 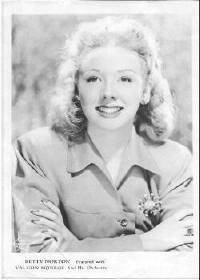 Betty Norton Passing . . . ??? couple of weeks ago." On August 23, 2016, we received word from Michael Holloway, Betty's grandson, that Betty Norton is very much alive! We take family members at their word. It is unfortunate when we are given false or inaccurate information that is often difficult to confirm. Our apologies for any confusion this has caused. Grace's daughter on her mother's career and her family . 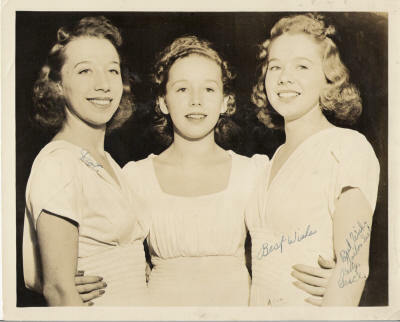 . .
Hi, I am the daughter of Grace from the Norton sisters, and I just wanted to say how very proud I am to see my mother and her sisters on your website. It's nice to see that they still get some recognition after all these years. I was just helping my mother clean out her closet of old records a week ago and there were many 78's of the band days. You can see in her eyes how fond those memories are and how proud she was of her and her sister's small claim to fame. I have many memories too as a child looking at her scrap books of pictures and newspaper articles about my mom and her sisters. I thought how beautiful they all were and what a wonderful experience it must have been for them. As my dear Aunt Betty mentioned on your website marriage was definitely the demise of the group. My mom stayed at home full time to raise my sister and I. It's really a shame because I think they could have been bigger than the Andrew Sisters had they stayed together. However it was a different time and era, not like today where most wives work full time, as I do myself. My mother met my father, Al Gallico (who was and still is in music publishing) at the beginning of her career and they're still happily married after 59 years. They have been residing in Beverly Hills California since 1975. My sister Gail, her husband, daughter, son in-law, and their two children (Grace's great grandchildren) are in California along with myself, my son and daughter. We are all very close and to this day I still love to look at her scrap book and best of all hear her and my dad's stories about the big band era and what great music it was.